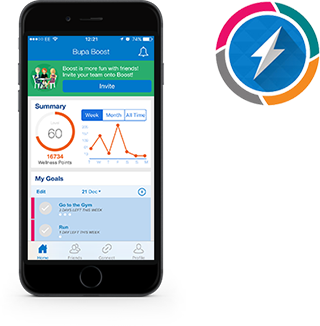 Boost is a free, easy-to-use app that allows you to take greater control of your personal health and wellbeing as well as giving you access to Bupa’s expertise and support. Set goals and create healthy habits – Small actions lead to big outcomes. Boost builds daily habits by reminding and rewarding to help you meet your goals. Connect to other health apps – Connect to your favourite fitness apps and wearables to track your daily activity and build a more rounded picture of your overall wellbeing. Bupa Boost focuses on four core areas of health and wellbeing: fitness, nutrition, mindfulness and relaxation. Using challenges, rewards and social engagement, Boost helps you nurture positive health habits. Whether it is going for a run or taking the stairs, staying active helps keep both your body and mind healthy. Mindfulness can help improve your wellbeing. It’s all about gaining awareness through stopping and paying attention to the present moment. It’s important to have a healthy, balanced diet to help fuel your body and prepare you for the day ahead. Switch off, slow down and feel the stress melt away as you take steps to help yourself relax. You can download Bupa Boost via the Google Play or Apple app store. You’ll need your company pin to register. Go to your company’s online Bupa portal or speak to your benefits and rewards team if you do not have this. "I really wanted to use Boost in a way that reinforced the things I’ve been doing to lose the weight I gained through pregnancy. Getting that holistic view of how I’m progressing has been so valuable." Designed to help you understand your current health status, set the right goals for you and keep track of your progress. Take advantage of the latest health advice available through informative video content, articles and our 24/7 Anytime HealthLine. Not only that, we have exclusive offers. Bupa Boost is not regulated by the FCA.